At least the Republicans have SOME individuals that are allowed (sometimes?) to think for themselves. I miss that. More than 76,000 migrants crossed the border without authorization in February, an 11-year high and a strong sign that stepped-up prosecutions, new controls on asylum and harsher detention policies have not reversed what remains a powerful lure for thousands of families fleeing violence and poverty. Doubtless this isn't going to hurt Trump's stand. It just makes it look like more of an emergency. Interesting that Trumps CBP reports an 11 year high after he declares an emergency. I guess we should just trust the numbers, huh? This is the same CBP that had a literal web page saying a wall is a waste of taxpayer dollars? Am I correct? I suspect it has more to do with people who want to come here believing the hype and so rushing to come across before the border is "locked down". I dont think any such lock down will happen. And I suspect when that becomes obvious, numbers will return to the much lower numbers we've gotten used to. Probably all Republican plants trying to stir up a frenzy. Trump tells his base another lie. Say it aint so. His supporters don't care. They believe anything he says. I have had friends that we knew were compulsive liars. They just said things, and we knew it was a lie...but that was them, and we laughed it off. They couldn't help it. Trump is equal to, or worse than that. And before someone quotes me and tries to say I'm wrong...Tim Apple. 10% raises for the military. I never heard of David Duke. He would rather tell a lie than the truth. Eh, that even makes it worse. I guess the posters were saying we have to have this wall and it won't even solve all of our drug/immigration/crime/terrorism problems. I doubt that any sane person believes it will solve all the problems. The cost versus benefit makes it worth putting in place, however. As I've said before, the only real answer to the problem is of a legislative/law enforcement nature. Stop giving housing, food, medical and education to the masses that force their way in and financially cripple businesses that hire non-citizens. The flow would dry up in a matter of weeks or months. It would only take as long as the word of mouth to spread that we are serious. Of course, citizens would then begin to see how much extra they'd be paying for everything from construction to lawn care and domestic help in businesses and private homes. We could organize militias for night-fire exercises. "and the rocket's red glare..."
Seven people in one day with hundreds of police officers guarding. and weren't deterred or hindered by the fence at all. It stopped 99% of the illegal entry. It has surveillance devices that allow them to respond when people start digging under or hoisting ladders. It doesn't hurt that those trying to get in realize they'll be shot instead of given 3 hots and a cot, either. i love reading liberal msm i know whatever they report is actually the other way around. do not need to fact check, they constantly lie, it is proven over and over again. "i love listening to lies knowing the truth"
When literally every one of those outlets has verbiage that is nearly identical, it's easy to see they are disseminating talking-points. Nothing but propaganda. Sure, a few facts will be thrown in. The best lies are those that include a small amount of truth. The gist of the message can be skewed so that the actual text doesn't really matter. Then again, some of them are so blatant in their need to assassinate Trump's character or actions that they've become overtly childish in their attacks. They're just a joke now. How do they know how many illegals get through ,if they aren't caught . It's easy, just look at the welfare roles in the states they land in. Look at the numbers of new students or new patients in hospitals. I think you hit on part of the reason why a fence works in Israel or Hungary and not the US. The "sugar" behind the fence is what brings them in. Israel has no "sugar". The US has no motivation to remove that- even our president has a history of hiring illegals for decades. Then the problem is our politicians more so than the illegals. 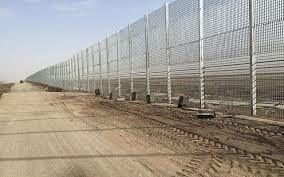 The fence should be around DC...along with some minefields and AAA batteries. There's a big difference between legal immigration and illegal immigration. Legals have been vetted for criminal history, diseases, the ability to speak basic English, etc.. Illegals can contain any known element. I have zero problem with legal immigration from any country or race. But as long as it make Trump look bad, hey let's keep letting illegals in to take your jobs and benefits. in nyc vast majority of fruit stores\construction site\landscaping businesses, have illegals working for them, along with many other low paying jobs, and in some cases not so low paying. there is absolutely not hard to find illegals here, they are everywhere. What's even more alarming is that some of them had secret security clearances to have access to the president and his rooms. What's making him look bad is having numerous employees that were illegal aliens and keeping them around for decades. Trump continually makes himself look bad, no doubt.